The January issue of The Bahamas Investor magazine carries a 20-page in-depth look at the Bahamian economy moving into 2012. The special Economic Report covers the state of the economy at the end of 2011 and profiles projects and companies that are helping to drive growth into 2012. The domestic economic environment during 2011 has to be viewed in the context of a weaker than expected recovery in the global economy and less positive performance indicators for the US, according to The Central Bank of The Bahamas. However, initial indications are that the gradual improvement in the domestic economy was upheld through the latter half of the year, supported mainly by ongoing construction sector projects and more modest gains in the tourism sector. At press time, the International Monetary Fund (IMF) estimates that growth during 2011 will be around 1.3 per cent and predicts growth of around 2 per cent for 2012. This modest recovery in 2012 and relative stability in 2011 defies the general global economic trend in developed economies, at least to some degree. The Bahamas Investor Economic Report looks at the underlying factors that are shaping the economic landscape in The Bahamas. The report profiles companies that have found success in adversity, as well as looking at infrastructure projects and economic policy, and the role innovation plays in building for future growth. 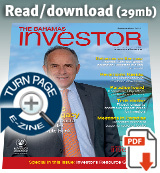 Read the entire Economic Report in the new issue of The Bahamas Investor out January 1, 2012. The Summer saw the release of the July-December issue of The Bahamas Investor magazine, whilst the jurisdiction had a close encounter with Hurricane Irene. Here is a selection of the top posts on thebahamasinvestor.com during the third quarter of 2011. The last few months of 2011 saw a flurry of activity, with the Baha Mar resort completing the first stage of construction and BTC rolling out 4G technology. Here is a selection of the top posts on thebahamasinvestor.com during the final quarter of 2011.